In Popular Mythology, the process my which we create future culture through our modern culture, all groups and people strive to have a collective contribution. 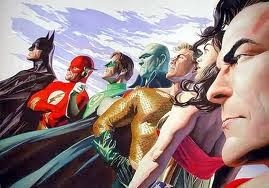 For comic book geeks there are few properties as hallowed as the Justice League. Through the power of the cinema, elements of culture are canonized into the larger culture. With the success of the Avengers, WarnerDC has a new found desire to present their team to the modern American temple for canonization. This is a big deal. Let us examine what Zack Snyder & WarnerDC will be presenting as the most signifcant and meaningful super hero property. How will they, and how should they present the new Olympus to the masses? Behold the new gods of our Earth, the Justice League and let us view our these efforts from Olympus on High!